How often has your broker told you to buy defensive stocks? Every time there is a market correction, the so called defensive sectors fetch the limelight. The perception is that whether GDP growth is high or low, no one stops buying consumer durables and medicines. And therefore the stocks can stay resilient. Demonetisation or what is popularly called Notebandi changed that! The demand for most essential items including lifesaving drugs has taken a hit. FMCG companies have seen big drop in semi urban and rural areas. And pharma companies are also seeing a dip in the domestic demand. 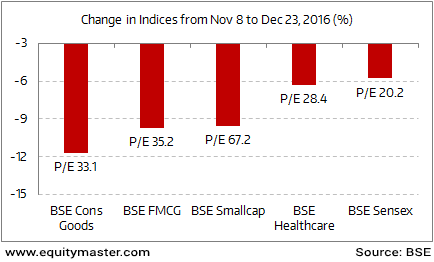 The Consumer Goods, FMCG and Healthcare indices have corrected by 6% to 12% since November 8, 2016. In fact the correction is almost at par with that of BSE Smallcap index, with much riskier stocks in its components. The valuation multiple of the defensive sectors have come off the peaks over the past month. However, it's the disappointing earnings that we expect over the next few quarters, which could bring the multiples to our comfort zone. And that would be the best time to look for not defensive but safe stocks! Equitymaster requests your view! Post a comment on "Demonetisation Effect: Defensive Sectors Corrected As Much As Smallcaps". Click here!